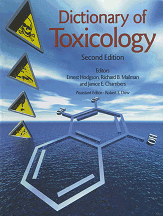 Editors: Hodgson, Ernest, Mailman, Richard B. and Chambers, Janice E.
Comprises concise, informative entries on all the most important terms in toxicology. Coverage includes biochemical and environmental toxicology, chemical carcinogenesis, risk assessment and risk management as well as those aspects of analytical chemistry and molecular biology that are of importance in toxicology. The most important toxic chemicals are covered, in most cases with structures and CAS numbers.